IDA Pharmacy Construction | Sarnia | Carosyl Home Additions Inc.
As the owner of an IDA pharmacy, you are invested in providing your Sarnia patients the best possible patient care. With Carosyl Home Additions Inc., your compassionate and caring services can start right at the pharmacy construction phase. We’ll meet with you to discuss pharmacy design floor plans and other aspect of your pharmacy design and determine the best construction plan for your needs. Getting your IDA pharmacy up and running quickly and efficiently is important, and with Carosyl Home Additions Inc., you’ll be working with a company who knows all the requirements, rules, and regulations, and can work closely with you to get your pharmacy on its legs in no time! Believe it or not, the floor plan of your pharmacy is crucial to the success of your business. At the floor plan design stage, we’ll work with building codes and bylaws that follow all government regulations, and also work within your budget. It’s important to know that designing your floor plan yourself is a flawed goal. At Carosyl Home Additions Inc., we’ve been working in the commercial construction industry for over 36 years, and can get a design made up to code and within your budget quickly. Our pharmacy design floor plans also ensure optimal ease of use for your staff and clients. Accessibility is a top priority for pharmacy visitors, and we’ll make your IDA pharmacy easily accessible for clients with all ailments and from all walks of life. Fully licensed, bonded, and insured, when you work with Carosyl Home Additions Inc., you’ll be working with a team of quality contractors who have been working in the local commercial and residential construction industry for nearly 40 years. Accredited by the Better Business Bureau with an A+ rating, we pride ourselves in being able to offer our clients top-notch services at competitive prices. No matter how small or large your project is, we’ll use our experience and skill to complete it how you want it, when you want it. Especially when you’re embarking on a complicated construction project such as pharmacy construction, you’re going to want the best of the best. And with Carosyl Home Additions Inc., you’ll get just that! Carosyl Home Additions Inc. never cuts corners. From the initial design process all the way through construction until cleanup, we’re available to provide advice and construct your IDA pharmacy to the highest standards. Wall construction, painting, installation of fixtures, and more. We have even built relationships with trusted contractors who will be responsible for electrical, plumbing, and anything else outside of our range! 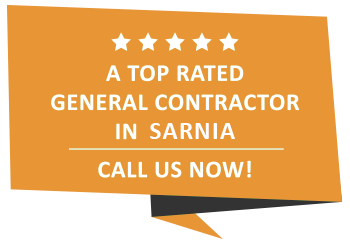 The Carosyl Home Additions Inc., team enjoys every new construction project that comes our way, and that passion is what has made our work stand out in Sarnia for the past 36 years. However, when we construct pharmacies we feel just as good as you do about creating a structure that will have the purpose of helping people. Meet with us today—we’ll even provide you with a free estimate for services! Just pick up the phone and dial.